Having finally been allowed into the pro peloton by governing body the UCI, in late 2015 on a trial basis, disc brakes were summarily banned after only four months, following a nasty injury to Francisco Ventoso (then Movistar) during the 2016 Paris-Roubaix. There’s controversy over the deep cut on Ventoso’s shin actually having come from a disc. Only eight riders were using discs, and none reported any collisions. Also, the Spaniard injured his left leg after contact with another rider (neither fell). Discs are mounted on the left, and many observers believe the injury was more likely to have been caused by a chainring. 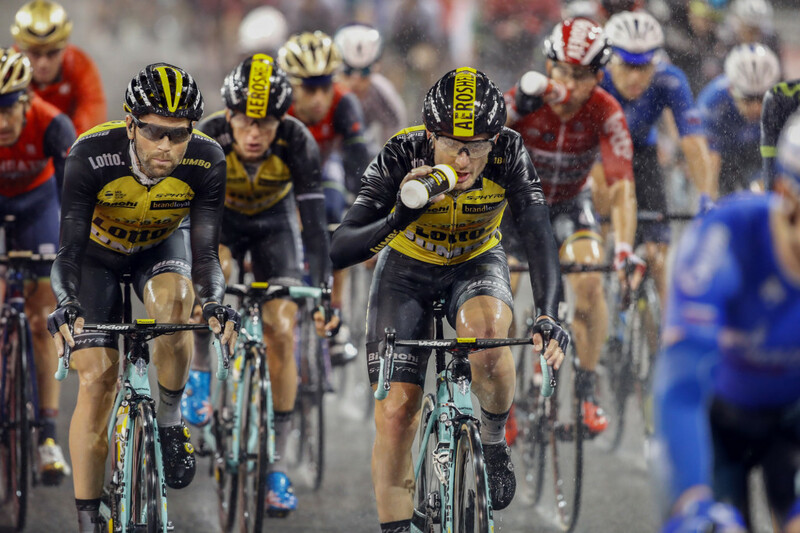 Another similar incident occurred at the start of this year’s racing, at the Abu Dhabi Tour in February. A crash that resulted in an injury to Team Sky’s Owain Doull – and some suspicious-looking scuffs to this race shoes – was initially reported as having involved Quick-Step’s Marcel Kittel, who was racing using discs that day. Similarly, later analysis suggested that the damage to the Welshman having been caused by a disc was unlikely. Nevertheless, the German reverted to rim brakes for the following day’s stage, and the controversy continued. Whatever the UCI do next and however long the pro peloton takes to fully adopt the technology, disc brakes are becoming increasingly popular with regular riders. Here’s everything you need to know about the advent of discs. Hydraulic discs offer considerable benefits, with the most obvious being superior stopping power, lower lever pressures, easier modulation and more consistent performance in the wet; they’re further from spray and dirt. 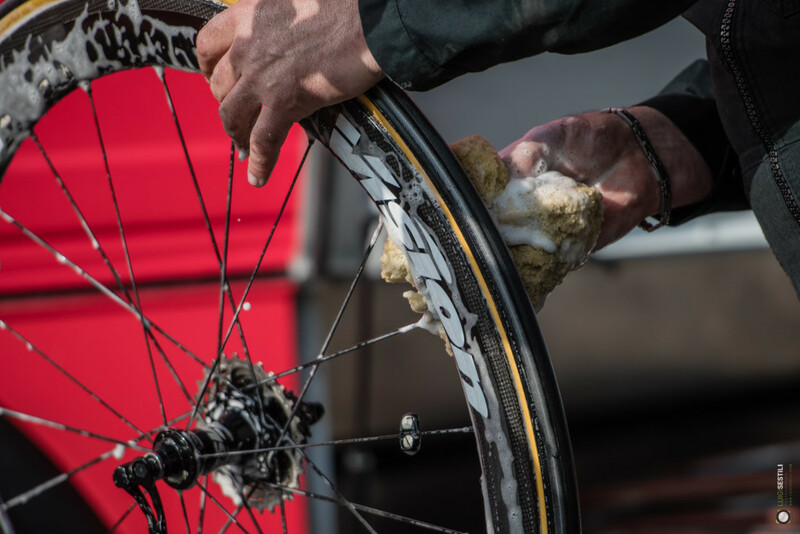 As there’s no need for a braking surface, disc rims can be thinner and lighter – and the rims never get worn out, either, so investing in some superb new wheels isn’t compromised by being endlessly rubbed by pads. There are challenges to fitting discs, however. Because they’re offset from the bike’s centerline, they induce twist that rim brakes don’t. Technology such as stronger fork tips, reinforced chainstays and seatstays and bigger, hollow axles are all examples of the design developments required to keep disc-equipped bikes on the straight and narrow. Heat is another problem. Brakes work by transforming kinetic energy into heat energy via friction, so the more braking power you have, the more heat you generate – and therefore a greater need to dissipate. Under extreme conditions, it could even be enough to damage carbon or boil hydraulic fluid. Pad cooling fins, alloy brake mount heat-sinks and alloy-sandwiched steel discs (alloy cools more effectively than steel) have all emerged to combat it. The biggest potential for injury from discs – beyond freak accidents that could equally likely involve other components such as chainrings, pedals, spokes and bar ends – comes from burns. Under heavy, prolonged use, disc temperatures can easily reach 100 degrees centigrade. No! Far from it. It’s a light, simple and relatively cheap solution that still has plenty to offer: check out the K-Force and SL-K options from FSA and the Vision Trimax Aero Caliper brake. For pure performance, however, discs are surely the future – especially when the weight penalty is so easily negated with carbon or lightweight alloy parts. The UCI’s lower limit for racing may be 6.8kg, but production bikes go as low as 4.4kg, so there’s plenty of wiggle room for discs. The question mark over safety, however – while it may be fuelled more by emotion than demonstrable fact – could still cause problems between riders for some years. There is some irony that stronger, more consistent and easier-to-use brakes have become controversial on the grounds of safety. Time will tell… keep your eyes on the pro peloton this year and follow Vision’s WorldTour and Pro-Continental teams. 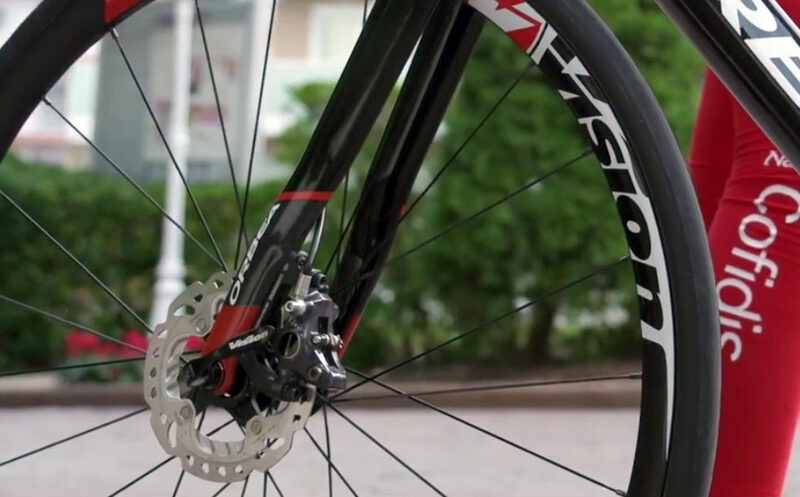 Disc systems are also net heavier than rim brakes; they’re more complex and more expensive. The necessary frame/fork strengthening also adds weight, and if you want to upgrade from rim brakes you’ll need a compatible frame, fork and wheels which should be considered as part of a planned upgrade program for road or TT/tri.